Get Ready for the 2016 Geminids! The Geminids are a meteor shower that occurs in December every year. The best night to see the shower is Dec. 13 into the early hours of Dec. 14. The Geminid meteor shower is caused by a stream of debris left by the asteroid, 3200 Phaethon. When the Earth passes through the trails of dust every December left by 3200 Phaethon, we see the Geminid meteor shower as the dust (meteoroids) burn up in Earth’s atmosphere creating meteors. Geminids travel through Earth’s atmosphere at 78,000 mph and burn up far above the surface. To observe the Geminids (if it’s not cloudy), get away from bright lights, lay on your back and look up. Let your eyes get adjusted to the dark – you will see more meteors that way. Meteors can generally be seen all over the sky so don’t look in one particular direction. This year’s shower is also on the same night as a full (super) moon so viewing the shower will be more difficult. If you see a meteor, try and trace it backwards. If you end up in the constellation Gemini, there’s a good chance you’ve seen a Geminid. Given clear weather and dark skies, the Geminid meteor shower can be seen by most of the world, though it is best viewed by observers in the northern hemisphere. This year’s bright moon will wash out all but the brightest Geminids, reducing the rate you can see them significantly. You can expect to see an average of one Geminid every few minutes in dark skies at the shower peak in the northern hemisphere. In the southern hemisphere, the Geminid radiant does not climb very high about the horizon, so observers will see fewer Geminids than their northern counterparts. Most of North America will miss the traditional peak, but because the Geminid activity is broad, good rates will be seen between 10:30 p.m. on Dec. 13 and dawn local time on the morning of Dec. 14. 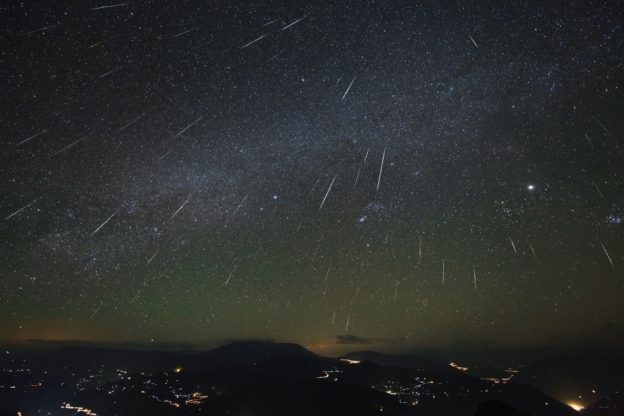 The most meteors should be visible around 2:00 a.m. local time on Dec. 14. At 2 p.m. CT/3 p.m. ET, engineers & scientists from NASA’s Meteor Environment Office at NASA’s Marshall Space Flight Center will answer questions on the Geminids during a Reddit Ask Me Anything. If you are in an area with cloudy skies, NASA’s Marshall Space Flight Center will broadcast footage of the shower (pending clear skies here) starting at 8 p.m. Dec. 13 until 6 a.m. on Dec. 14 on Marshall’s Ustream account. You can also see Geminid meteors on NASA’s All Sky Fireball network page. Follow’s NASA’s Meteoroid Environment Office on Facebook for information on meteor showers and fireballs throughout the year. Camera is ready , just waiting the for the show !